“I initially read the book just to enhance my travels in Indonesia and for Bali cost of living info, but your book really got me thinking! Hard to get any work done now!!…. A young person (of any age) seeking ways to avoid sitting in a cubicle for the best years of your life? Nearing or in retirement, wondering if you have enough savings or pension to continue to live well? Tired of the rat race and ready for a break to plan the next phase of your life? I feel lucky–I know hundreds of people who used to be in one of these three categories. People who found a tropical island to both enjoy today and create a better future. A place you can live very well, at a fraction of the cost back home. No two stories are alike, and they each deeply, sincerely inspire me. So I wrote a book about how to do it. 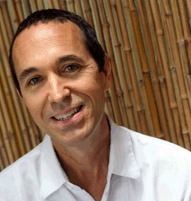 I packed it with everything I’ve learned since I established a base in Bali and bought property with my wife in 2005…as well as every tip and lesson I’ve learned from others. 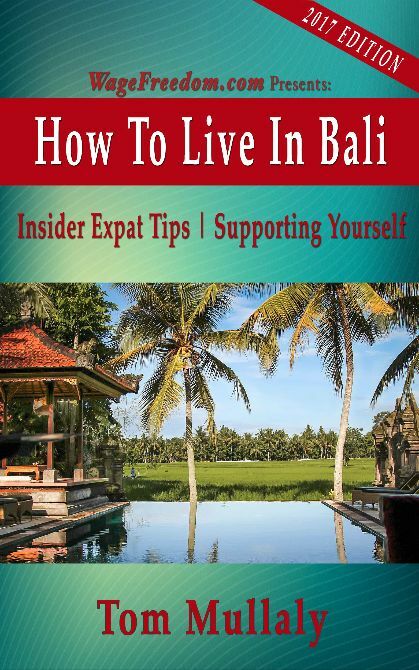 How To Live In Bali comes in at just under 30,000 words. It’s grown over the years from a Bali cost of living guide to a comprehensive 2017 Bali ‘expat kit’: everything you need to know about staying longer than a tourist would on the “Island of the Gods”, all in one place. Moving to Bali might not be for you. My aim with this book is not to convince you that it is. My hope is that you’ll come away with enough info to be fairly sure one way or the other. The best areas to live in Bali, and pros/cons of each. Seven distinct accommodation options you have in Bali, and specific examples in various price ranges, with photos. Value for money is better than you’d dare imagine! The best visa to get for longer stays, and how you can get it before you ever leave home. Your transportation options, and costs. My own concept of Bali as a three-tiered economy, which will inform important decisions you make on where to live, shop, eat, socialize, etc. in Bali. How to navigate the often-misunderstood situation as to foreigners owning property in Indonesia. The specific caveat you must understand, no matter how good your Indonesian notaris is. And, what I think is a far better option than purchasing property (and I say that as a property owner). The only three Bali hospitals I and my family visit if we have a problem. How you can find extremely inexpensive flights from all over the world to Bali. Less than $500 round trip from the US? Yes. Really. A locals-only insider tip that might save you more money on your first trip in from the Bali airport than the cost of this book! What you shouldn’t drink with a bunch of friendly locals out in rural areas of Bali. The current situation with dengue fever and rabies. How to handle getting pulled over by the police on a motorbike or a car (because you probably will). The only type of taxi you should ever take in Bali. How to stay in Bali for free. No freeloading. 100% legal (obviously). The lifesaver Indonesian apps you need for your phone to get deliveries from restaurants and markets, a manicure or a massage, etc., in case you’re sick, or just feeling lazy. The pros and cons of the different transportation apps available in 2017 (hint: I never use Uber in Bali). Travelers’ insurance vs. longer-term expat insurance: knowing the difference and determining which coverage you need. The four-letter word you’ve never heard before which describes the type of Indonesian accommodation I recommend for you to live very well, if money is tight. How you can save big money on ATM fees, including the exact checking account you need to pay ZERO ATM fees if you’re American. The document you really should get for driving, before you ever leave home. The best place in Seminyak to go to get your phone connected to the internet and set to make calls (10 minutes or less), to avoid confusion or getting ripped off. What you must consider as you decide between getting around with a car or a motorbike, or possibly without either (you read that right). Don’t sign a lease until you read this chapter. The only place you should change foreign currency into rupiah in Seminyak. Because of this, the centerpiece of How To Live In Bali is the chapter on supporting yourself in Bali. It’s huge. My task in this chapter was to cover the best and most popular ways to earn in Bali, from jobs (not the best way) to businesses you can start, to explaining the very best way of all for most people–managing online income streams–without completely overwhelming readers. I believe that whatever work experience, interests and aptitudes you have, you can create income streams to support yourself in Bali. If you have no idea about using the Internet to earn, I’ve done my best to explain basic-to-intermediate concepts well enough to 1) show that earning the US$600 to $800/month you’d need to get by in Bali at minimum is within your grasp and 2) get you excited to learn more, using links I provide to authorities who will provide you with excellent, free education. Of course there’s also an additional ‘links’ sections to get you started on Bali research, so you’ll be saving both time and money when you arrive in Bali. If you’ve ever wondered about the practicalities and prices of living on a tropical island in Asia in 2017 and beyond–I mean a clear-eyed look at staying longer than a tourist would–you’ll have everything you need to know in one book here. Indonesia is one of the cheapest places to live in the world, and Bali is one of the cheapest places to have a base or retire and live really well. You might be very surprised at how many people do this nowadays. If you’re familiar with WageFreedom.com you know I cover topics like Bali and Asia travel, specifics on how to use online income to support a traveler/expat lifestyle in Asia (or in your hometown for that matter), and the mindset one needs to redefine their life. This book is an extension of these themes and reflects thousands of interactions I’ve had with Wage Freedom readers since 2008. It contains every lesson I can think of from my years in Bali. Below are a few excerpts from the 2017 edition of How To Live In Bali, to give you an idea of the level of detail you’ll get. over the years the crowds slowly rolled north along the beach to the Legian/Seminyak area. You’ll still hear people tell you about when Jalan Legian was a dirt road in the 70’s. Though development has increased a lot in the last 10 years or so, you’ll still feel the lower population density and slightly slower pace compared to Kuta. Here you’ll find a crowded beach scene, lots of good restaurants, “The” Bintang supermarket, and large houses behind high walls mark this area as the place where people stop just visiting Bali and start to set up for the longer term. From here north for many miles, Bali houses and villas will be available down the side streets and small alleys, beckoning you to find them. continue north from Legian/Seminyak and beginning more or less at Jalan Oberoi (aka ‘Eat Street’), you’ll find yourself in Petitenget. This area was mostly long stretches of rice paddies less than 10 years ago but is now mostly villas, good apartments and some of the best restaurants in Bali. For longer-term stays the center of gravity has definitely shifted north over the last several years from Seminyak to Petitenget, and even points north, in my opinion. Development near the beach here tends toward the high-end with hotels like Oberoi and The W, and a lot of high-end villas. 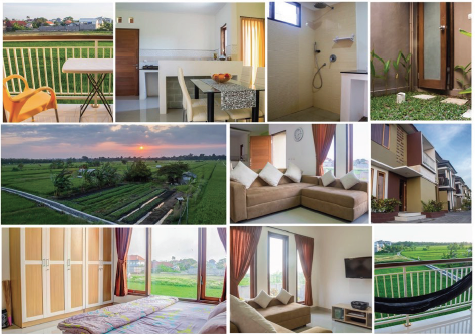 Come inland a little and set yourself up in a less expensive house, apartment or even a kost (please see the ’Accommodations’ section) and benefit from the infrastructure that’s risen from the rice paddies. The restaurants and cafes you’ll find here offer casual quality, generally very good value for money and a slightly upmarket vibe, generally without being pretentious. Not to overstate it: obviously there are still tourists, but not exclusively so, as in Kuta. …one of the reasons I knew I had to update my old cost of living in Bali guide is because of all the good-quality western-style apartment complexes popping up all over. If you’re on a budget (even a very tight budget by western standards), baseline monthly expenses have really dropped, and you really don’t have to sacrifice comfort or location. This part of this guide will show you how little money you need to live well in Bali. For most people the quality, price and wide selection of apartments or kosts (see below) in 2017 means that they will simply be the way to go. Even if you’ve been intending to come and buy property in Bali, I’d rent first and buy later…. Like anywhere else, apartments might be unfurnished, but often Bali apartment rentals are of the ‘serviced apartment’ variety, with all the creature comforts right down to cutlery in the kitchen. The 10-panel image here is of a nice 2-storey apartment in the eastern part of Kerobokan about 15 minutes by motorbike from the beach, costing 60 million rupiah/year, by the year. Full kitchen, gorgeous rice paddy view. 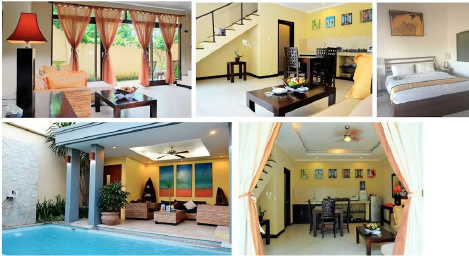 The five-panel image to the right is a furnished apartment in the middle of Petitenget, 5 minutes’ walk from Jalan Oberoi (‘Eat Street’), 5 minutes to the beach on a motorbike. Open floorpan downstairs, enclosed bedroom with A/C. 12 million/mo for a six-month lease. Above photo is an Ubud 1-br apartment, 6 million/mo or 5.5 million/mo paid in advance. 2x weeklong cleaning included. Yes, that is a rice paddy view! You will find accommodations in Bali in many ways on par with apartments you’d find back home, new often with cable TV, maybe a shared pool and maid service also, and possibly Internet connection included. On the low end the line between kosts (see below) and apartments will get blurry, let’s say decent well-located apartments start around 4 million/month and go up from there. If your vision of staying long-term in Bali will require budgeting to pull off, this section is for you. Basically here’s where the cost of living in Bali meets recently-upgraded amenities to give you world-class opportunity to live well. Remember that currently (May 2017) US$100=1.3 million rupiah. Kosts are comprised of several small one- or two-room apartments arranged around a central courtyard area. Rooms in very cheap kosts might have a bathroom outside; sometimes the toilets and kitchen areas are shared, and outside. 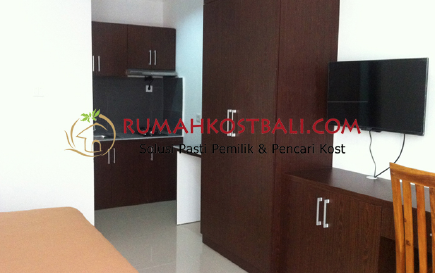 You can find kosts for 500,000 rupiah to a million per month if you aren’t too picky as to location or amenities. With kosts you might have to borrow or buy furniture and cooking supplies. If you’re really on a budget and don’t mind a few rough edges, going this cheap could be the difference between being in Bali and not being able to afford it. I’ve met plenty of westerners over the years staying in kosts and if you’re serious about saving money in Bali they are the cheapest option of all. Even readers not on a particularly tight budget should still be excited because in 2017 kosts are often much nicer than they used to be. They are still small, but sometimes more like a newish hotel room with cooking facilities. As I researched this guide for 2017 I was amazed at how so many kosts have been upgraded. I suppose it shows how many Indonesians are earning more than they used to, as well as demand from longer-term foreigners in Bali too no doubt. And why not take advantage of the low cost of living in Bali relative to your biggest expense–accommodations–if you don’t have to compromise on comfort and location? If you’re new to driving in Asia you’ll probably find driving in Bali somewhere between fairly stressful and extremely stressful. You don’t really spend more money, versus renting a car with no driver. If you’re exploring the island it’s easier to relax and take in your surroundings. Daily car rentals: in 2017 you should be able to negotiate a deal with one of the drivers who’ll approach you constantly for about 500,000 rupiah for the whole day, depending on the season and the car. I also have friends who pay a person with a car to be their driver, by the month. All things considered, you can find drivers more inclined to take a guaranteed monthly sum from you to quit having to sit outside day and night waiting for tourists. The price would be highly negotiable, several million rupiah per month at least. Go slowly and don’t broach the subject until you know a driver quite well. You’d prefer good character as much as a competent driver. From what I’ve seen the driver becomes a general aide or ‘right hand man’, a mutual symbiosis which can be extremely handy (for two of my friends at least it has been) if you find the right person, especially frankly if he is Balinese, in Bali. Renting a motorcycle couldn’t be easier, as you know if you’ve ever visited Bali. Daring to walk down the street as a foreigner rather than being on two wheels is apparently a personal affront to the rental guys you find every few feet! It’s always a renter’s market.